Every time I talk about this series, the first thing I want to bring up is clarity. 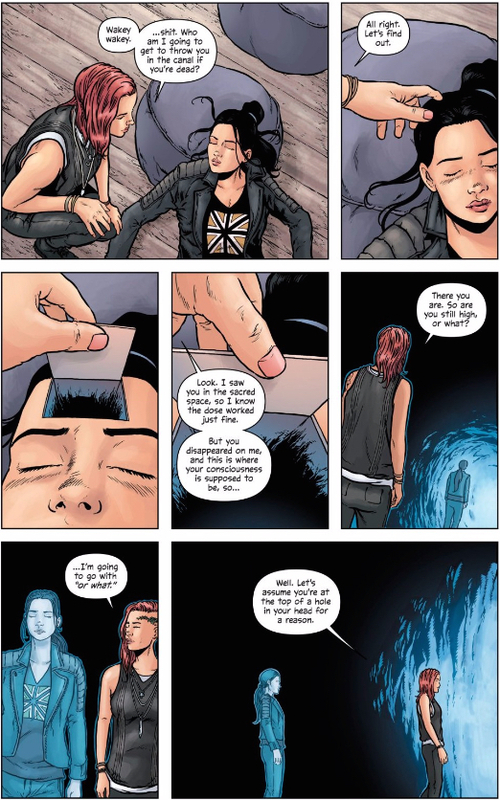 Writer Warren Ellis and artist Jon Davis-Hunt have struck such an alluring balance of crystal clear in-the-moment actions and emotions while keeping the larger motivations and machinations in a shroud of mystery, I can’t help it. While I’m sure there’s fun to be had speculating on the unclear elements, I’m most excited by the ways Ellis and Davis-Hunt cultivate their clarity. 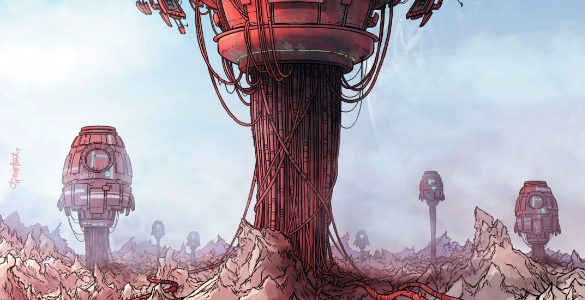 Beyond being fun to talk about, the clarity is deployed with such deftness, each issue serves as a masterclass in comics storytelling, allowing our discussions to zero in on details like fight choreography or procedural elements. This issue affords us a closer look at another idiosyncratic element of comics storytelling: the mid-page scene transition. Actually, mid-page scene transitions are a little weird, even for this series. Scenes tend to end at page turns, or at least the end of a page, so getting transitions in the middle of the page is somewhat disruptive. It’s an effect that Ellis and Davis-Hunt work both to mitigate and emphasize, ultimately utilizing the medium to broadcast just how jarring the Doctor’s abilities are. But not before walking us through the basics. The first transition is elided over as Evi begins her story, immediately snapping us to the place and time she’s talking about. We’re at the cafe one moment and in the Doctor’s studio the next, but the continuity of Evi’s narration is enough to carry us through that transition without any confusion (though Evi’s presence in that third panel, weird hat and all, definitely helps). We get a similar transition back to the cafe at the end of the story, priming us for the next transition (which, oddly, picks up exactly where Evi’s story leaves off, disguising a hard cut as another flashback). Granted, Davis-Hunt actually guides us into the new location here, so this is less a scene change as it is a camera move, but what better way to clarify what’s happening? The Doctor is entering Jenny’s head, so we slowly zoom into her head-hole until we see our characters there. It’s just another technique to make us understand the change in location that happens between the start and end of this page. Since we’re already duly familiar with Jenny’s abilities, we get to be in on the joke when she makes her own mid-page scene change here, even though it’s definitely jarring. 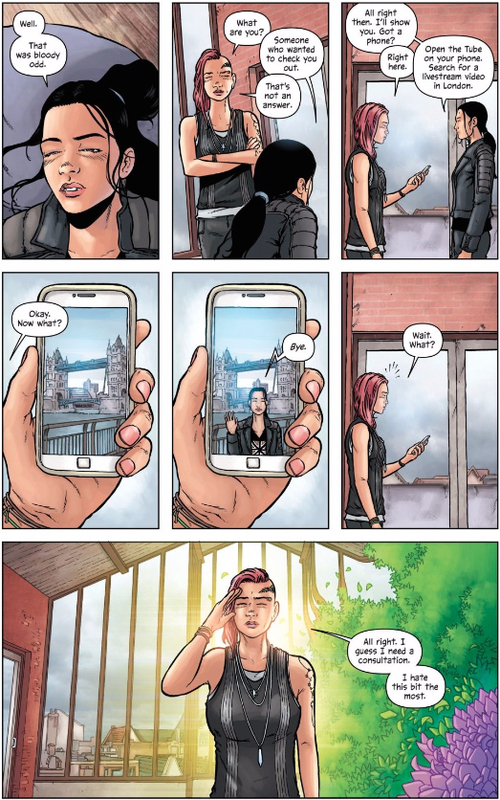 But then the Doctor does her one better, pulling off a mid-panel scene transition, though we don’t fully understand that until we see the next page and understand that she’s just transported herself to some kind of metaphysical garden. It’s the kind of transition that straight-up wouldn’t work if the creative team hadn’t already primed us for all of these unusual transitions and the Doctor’s own abilities. We may not have enough information to understand what this all means, but Ellis and Davis-Hunt make damn sure we have enough to at least understand what’s happening.